In the small, colonial city of Trinidad, the austere (yet pleasing, I think) Iglesia Parroquial de la Santísima, or Church of the Holy Trinity, surveys the main city square, Plaza Mayor. The church’s humble Neoclassical façade belies an exultant Neo-Gothic alter inside. Trinidad was a wealthy center of the sugar trade in the 18th and 19th centuries and its cobbled streets are lined with faded, grand villas and public buildings from that era. A few miles outside the city, over 50 sugar plantations operated in Valle de los Ingenios (Valley of the Sugar Mills), powered by the labor of tens of thousands of slaves. Trinidad and Valle de los Ingenios are both UNESCO World Heritage Sites. 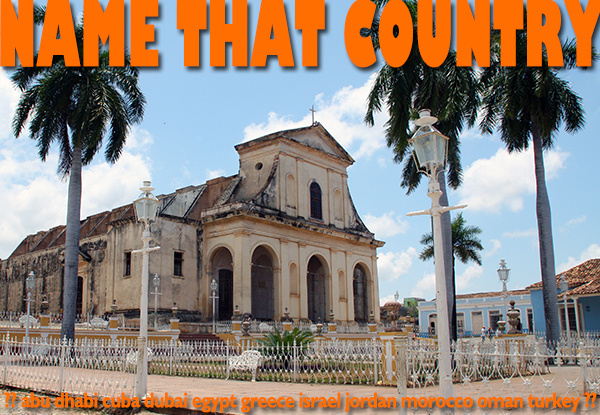 This entry was posted in Cuba, name that country quiz and tagged Cuba, cuba tours, Valle de los Ingenios by yalla2013. Bookmark the permalink.